One afternoon in the fall, two otters trapped me. I watched them fishing in a large beaver pond and then I thought they went into a nearby beaver lodge. I noticed that one of the otters left a bullhead fish on the bank across the pond where the otters often roll around and poop. So I walked around to see what shape the fish was in. 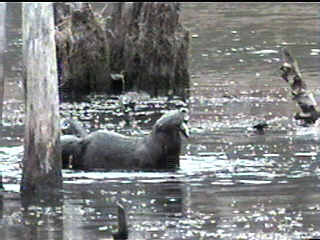 Then as I was kneeling down studying that, I saw the two otters heading right for me, no doubt, to get that fish. Of course, they saw me, dove and swam off under water. but not without periscoping up and snorting at me first. Make a note of that snorting. All the other mammals that otters might be confused with don't snort like that. and sometimes they do a series of dives just like a porpoise. Otters can eat the small fish they catch without pausing as they swim. Fortunately for our enjoyment of otters, they prefer catching a nice 6 to 10 inch fish that and raising it up above the water level and eating it by repeatedly chewing. Of course, there are other mammals swimming in ponds and rivers. Of them only the mink rivals the otter in eating fish. and to get away from me they are prone to stay on shore, while an otter almost always goes into the water and turns into a fish. When an otter comes out of the water, it generally wants to roll in the dirt and poop in a way that lets other otters know that it has rights to the fish in the nearby pond. No mistaking the otter below as anything but an otter. and the otter's tail is never bushy. 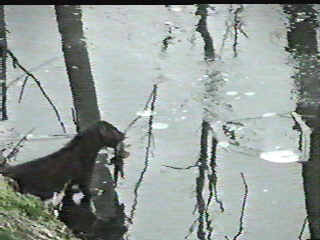 Minks also generally take their catch back to their den, which is what the first mink pictured above with the fish it caught, scurrying on the rain covered ice along the pond shore to its lodge in a dam 50 yards away. An otter usually gets right to work eating a fish, or, as the first photo on this web page shows, chomps its tail off so it can't swim away, goes off to get other fish and then swims back to eat it. 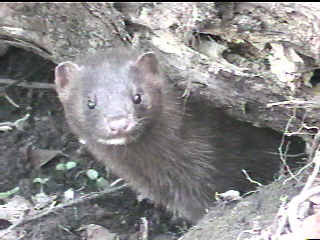 I have a web page about minks. The other two mammals commonly mistaken for otters are primarily vegetarians. On average the beaver and otter are about the same length, but on average the beaver is many pounds heavier: 30 to 70 pounds for adult beavers and 12 to 20 pounds for the adult otter. 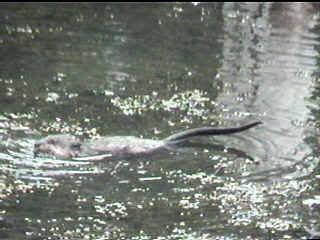 In the photos below the otter looks heavier but that's because it swims more out of the water, because it is lighter! But its hard for the beaver to hide its big triangle shaped head, bigger ears, and notice that paddle shaped tail, quite unlike an otter's tail shown close-up below. Over the years I've sometimes initially mistaken beavers for otters, especially when they are diving for roots in their pond. 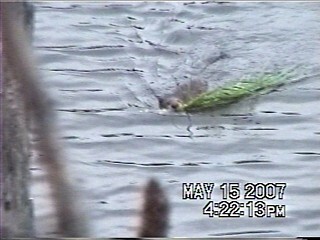 The photo shows the base of a diving beaver's tail which can look like the thick base of an otter's tail. 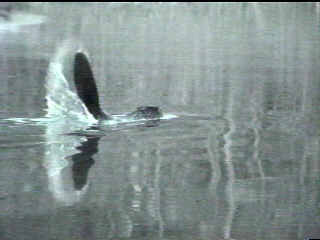 The video below shows a beaver repeatedly diving. 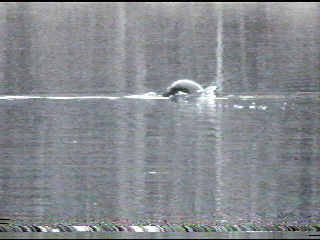 Especially when it is getting dark, which is when beavers are often out, that diving beaver could be mistaken for an otter. But in a few moments I can see the beaver's big head and ears and notice how slow it is. On rare occasions an otter will lollygag out in the water floating like a log which is what beavers often do. 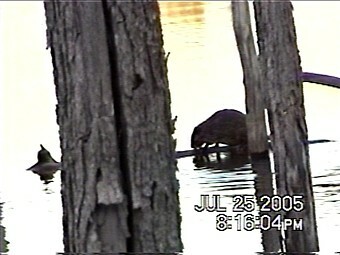 And beavers can surprise you with their agility in the water, especially if you scare them at the edge of the pond. I did that to a yearling beaver and it swam so fast underwater that it made an impressive wave and wake in the shallow pond. When a beaver tires of your presence, it often makes a big splash with its tail to try to persuade you to leave it alone. Otters never slap their tail like that. They have a different styles. Remember those otters that swam back to get the tailless bullhead that I was so rudely standing over? They made noisy dives and their heads soon popped up and they gruffly snorted at me, a noise they make by blowing air through loose lips. The otter in the video below didn't appreciate me talking back and as it snorted at me probably wished it had a tail as big as a beavers to drive me away. 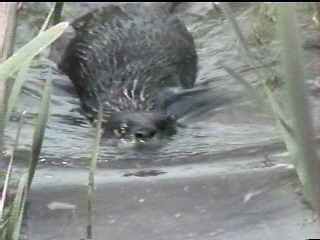 As it happened as the otter swam away from me it bumped into a beaver, which gave me a chance to video the contrasting styles of the two animals. When an otter is really upset, it screeches. And then there are muskrats. 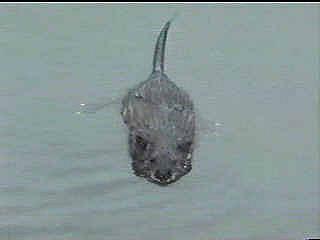 They are rodents like beavers though much smaller, half the length of an otter and a fourth of the weight. They can vary their diet but feast on grasses mostly and they are often seen carrying grass across a pond. And both the otter and muskrat propel themselves with their tail. So when a small otter is simply swimming through a pond without diving for fish, you might see the tail swishing a little behind it and think it is a muskrat. Of course, that's an otter on the right. Its wake is always bigger and an otter is faster. 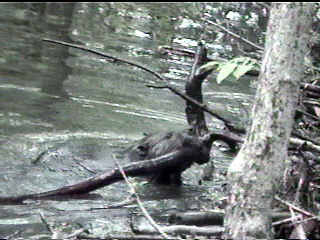 Finally both otters and muskrats have the habit of climbing up on logs floating in a pond. The animal on the right has much longer body and of course that is the otter. The animals are up on the logs for different reasons. Muskrats mark logs with their scent and pellet shaped poops to communicate with other muskrats. Otters sniff about logs because one way otter mothers feed their pups is by chewing up a fish and plastering the meaty remains on logs. 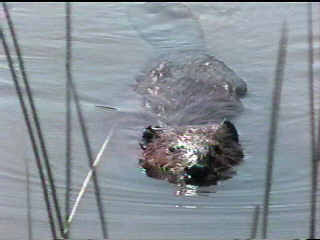 Seen up close, there is no mistaking a muskrat for an otter, but as the video below of muskrats seen at a distance shows, it is easy to mistake them for otters, especially when viewed through a camcorder or binoculars when it is not so easy to see how small muskrats are. 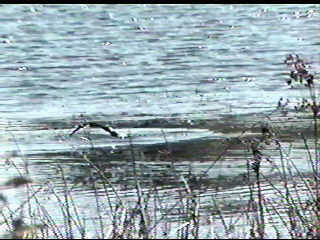 Here is a distant shot of four otters fishing, and what distinguishes them from muskrats are flourishes of their tail and higher cocking of their head. 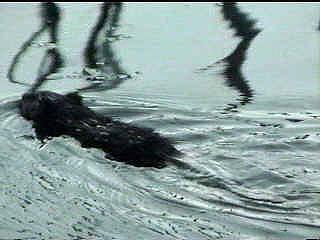 That said, when they are mating or fighting, muskrats can work their tails like jet skis, and that can look like otters. Fortunately often when they scoot like that the muskrats whistle which otters don't do. 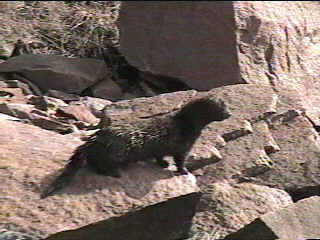 Another animal mistaken for an otter is the fisher. 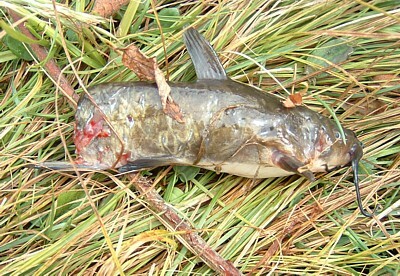 It is about the same size but despite its name a fisher doesn't swim in the water. 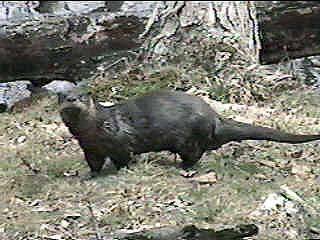 I see them occasionally and never mistook them for an otter since to get away from me they always fled to the woods not into the nearby pond. 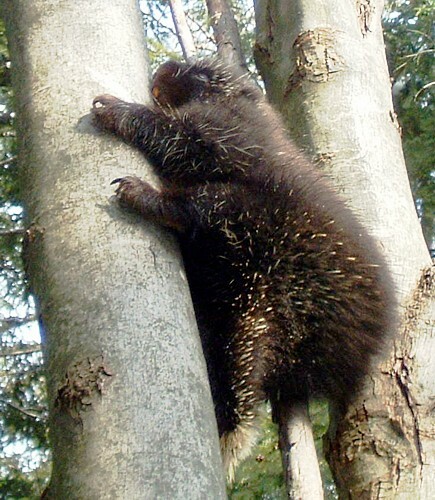 Fishers are much more agile on land than an otter, and fishers can climb trees. 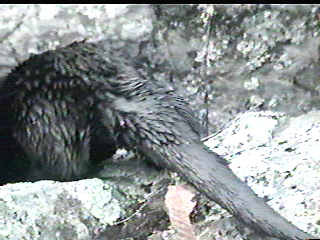 I have seen some otters make a start at tree climbing, but like me, they make of point of climbing a tree that's already fallen down, and as you will see in the video below, the otter pups have a hard time even at that. Speaking of pups, it can be difficult distinguishing between otter pups and beaver and muskrat kits. I am not much of an expert on that. I see these animals in the wild where mothers raise pups where there are lots of places to hide. Judging from the e-mails I've gotten over the years from people in the suburbs, the young of these animals are often easier to see there because there is less cover for them to hide in. I think muskrat kits are most often mistaken for otter pups because a litter of muskrat kits can throb in the water with their tails going every which way. Unfortunately, I don't have a good video of that. Muskrats often have two, sometimes more litters a year, so you can see their kits throughout the spring and summer. In North America, all otter pups are born, thanks to delayed implantation of the embryos, around the first of April. You rarely see them until June. 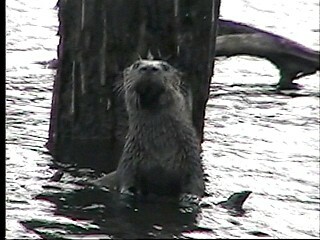 By the end of July, they have enough heft and uniquely otter-like energy so they should not be mistaken for muskrats. 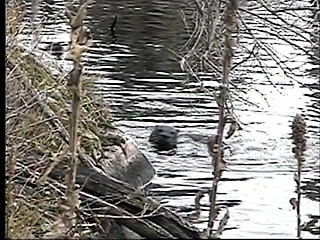 Here is a video I took of a mother and her pups as they emerged from a hole in a beaver dam. Wild as muskrat kits can get, they can't match that powerful whirl of action. 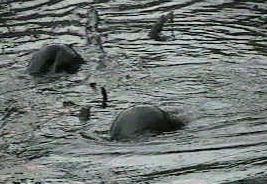 while with otters the mother exhausts herself feeding her pups with fish. The video clip of the beaver kit reveals the characteristic whines of the kit. Otter mothers and their pups keep in touch with high chirps. 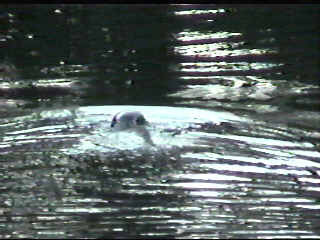 In the video below you'll hear the chirping of pups as the mother swims toward her den. I interrupt her and she tries to snort me away. Finally, I'll offer the most important tip for identifying otters. Of all the diving animals, including ducks, otters make the most dynamic ripples in a pond when they are diving for fish, and fish after all move and move again, not like the logs and grasses beavers and muskrats are after. 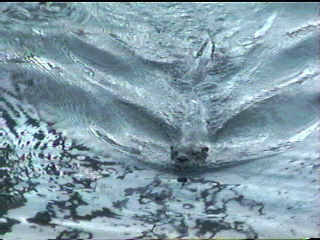 A number of otters can bring a pond surface to a boil with ripples. I hope you notice in that video that all those otters go about their fishing without chattering the way they do in the sound tracks of the nature films like "Yellowstone Otters." Remember, movie sound tracks are spliced in later and juiced up to add to the visual excitement. I can watch a group of four otters fishing in a pond for an hour and never hear any noise save the occasional splashing of water. So when you approach a pond and see the ripples from a dive or splash wait a few seconds. If you see another, and another, and the otters fill the pond with their fishing, then get down and get the binoculars out and look for an otter coming head out with a fish in its mouth or waving a pointed tail high in the air when it dives. Enjoy the show. 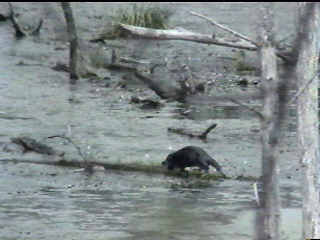 The 4 minute video below shows the poetry in motion I was treated too after I waited for otters to come out of a rock den forming the shore of a beaver pond.